After countless hours of hard work and planning, my book is finally published! Thank you for your support in the launch of my bestseller campaign! The best way you can help push this book to #1 Bestseller is to purchase a copy of the EBook or Print book. You can mail, blog, tweet, post or mention my campaign in your newsletter. Sample copy provided in this campaign. Click the Social Media tabs to get suggested review copy to easily post to social media. There are also sample chapters, email copy, blog posts, and other media tabs to tap into. If you know of a radio show or podcast where I might be a fit, please share! 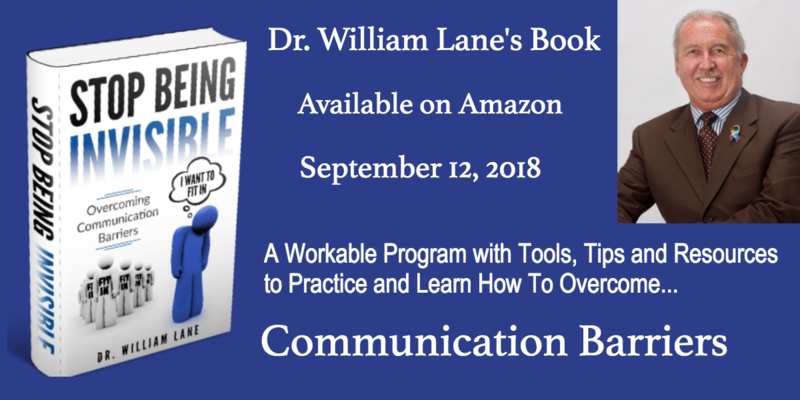 Dr. William H. Lane is an educational consultant, academic coach, and international speaker whose passion has always been improving the lives of those with special needs. He is a subject expert in verbal and non-verbal communication skills and personally understands these challenges. His focus is on teaching successful communication strategies. He believes that unless someone is willing to take the educational steps necessary, life for any individual with communication and social difficulties will be a continuing disconnection from family, friends, and society. As a former educator, his extensive background spanning 35 years included teaching students with exceptional needs, working as a school administrator, and serving as a university program chair and professor teaching graduate and undergraduate special education courses. As a consultant, he facilitates training programs to school districts and organizations. His professional development workshops provide teachers with strategies and techniques focusing on each student’s unique learning needs and creating an environment that enriches a student’s academic and social life. As a coach, he endeavors to analyze an individual’s performance and develop appropriate strategies for strengthening their communication skills. His strong demonstrated ability to produce tangible and positive outcomes through the development, practice, utilization, and retention of effective communication skills has led to overcoming their limitations and becoming confident and contributing members of society. "The purpose of writing "Stop Being Invisible" is to provide me with the opportunity to share how having limited communication abilities affected my life and, more importantly, those around me. After speaking with other people, I realized that there were many others whose lives had been affected to some degree by the lack of effective communication skills. You are the inspiration for this book and for my mission to help people learn to communicate and express themselves and improve their quality of life."